Remember a few days ago when I wrote about a comet that was not going to hit the Earth? Well, it turns out that even minus an impact, this is a pretty interesting object. 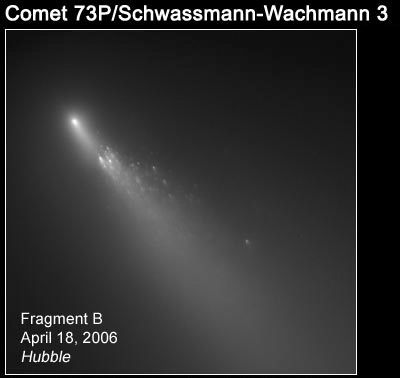 The comet's full name (take a deep breath) is 73P/Schwassmann-Wachmann. It was discovered in 1930, lost for a while, then recovered in 1979. In 1995, it broke apart into several pieces. The exact cause is a mystery, though there are plenty of reason why a comet would fall apart. Comets are made of rock and ice. When they get near the Sun, the ice sublimates-- turns directly into a gas -- and flows into space, which is why comets look fuzzy in pictures. The actual nucleus, the solid part, is very small, but the coma, the fuzzy part, can be thousands of miles across. It makes sense that after repeated passes of the Sun, enough ice is lost to venting that the structure of the comet can be fragile, since the ice in a way is holding the comet nucleus together. Once enough ice is gone, a breakup could occur if the sublimating ice builds up enough pressure to disrupt the structure. But that is just one explanation. The famous comet Shoemaker-Levy 9 broke apart because of the immense tidal forces of Jupiter's gravity. Most comets don't break apart; look at comet Halley, which has been circling the Sun for a long, long time (it was seen in ancient times). 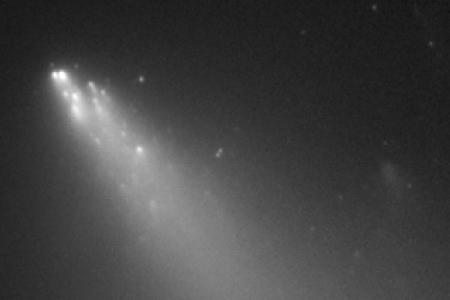 It goes to show that some comets are very fragile, and some are not. In my other blog entry, I talked about why we won't get hit by this comet. It's simply too far away to get any pieces of any real size to hit us. The nearest they'll get, in mid-May, is about 9 million kilometers (5.5 million miles). I got an email from a reader who asked me why, then, does the JPL page which tracks Near Earth Objects give a miss distance of only about 1.5 million km (1 million miles) for fragment 3-AL? Well, conspiracy aside, that's still a fairly comfortable margin -- though I'd be happier with a bigger number! However, I am happier, because that is a statistical lower bound to the minimum distance. The far more likely miss distance is 9.4 million kilometers (about 6 million miles). We're pretty safe.